Yesterday, Thursday, we made our way to the Cliffs of Moher. The weather was not the best, but we did get to see the Cliffs, and my pals really enjoyed it all. Earlier we had managed to recover the lost luggage, which thankfully had arrived at Shannon, so we were all much relieved. We did have some rain, which unfortunately was coming in from the USA but i suppose they have to get rid of it somewhere. Here we have, from the left, my cousin, Pat, Mike, her husband, Russ, and Denise, posing, with O'Brien's tower in the background. After leaving the Cliffs, we made our way to Galway City, where they stayed last night. This morning we began our tour of Galway city, with a stop off at the magnificent Galway Cathedral. This beautiful cathedral was built on the site of the old British jail, and was opened in 1965 by Cardinal Cushing. A lovely picture of Mike and Pat inside the Cathedral, with the beautiful Rose stained glass window in the background. If you do get to Galway, do pay a visit to this special cathedral, you will not be disappointed. I just had to bring Pat back to the old family homestead in Salthill, the sea side suburb, where i was born and reared. Deserted now for many years,it stands on a wonderful site overlooking Galway Bay, but no more than myself, it has been battered a little by the Atlantic breezes. Pat looks well though, doesn't she? We had lunch in the Galway Golf club restaurant, which was a real treat, especially for the ladies. We did not have much difficulty getting them in past the bouncers on the doors, as i explained to them, that for security reasons, we had to always bring along our own waitresses. Denise was not happy with this, but she was hungry, and went along with it. You know what golf clubs are like ladies, don't you? Americans seem to like sharing their food while dining, something abhorrent to us Irish, as you are likely to get stabbed if you go near one of our plates when we are eating. Just for the sake of peace, i agreed to share my strawberry bomb dessert with Denise, something i will surely live to regret if any of my friends find out. A strawberry bomb by the way, consists of vanilla ice cream, crushed meringue,fresh strawberries and fresh cream, with a dash of strawberry syrup on the top to finish it off. (You can see from that sneaky look of victory on Denise's face that she has fooled me into sharing, and that i will pay for that. A bit of the Adam and Eve in that, would you think? Here we have from the left, yours truly, my wife Sue, my brother Sean, my cousin Pat, and her husband Mike, outside the Golf club, having finished our lunch. After a really nice day together, we finally arrived back in Kinvara to our own home, where we had tea and cookies. Here we have my happy friends, seated around the kitchen table. It's hard to beat an Irish cup of tea. This has been a very special tour for me as it is not often i get to be with my cousins from the USA. Like most Irish people, we have relatives, and children of our own, in the USA, and elsewhere, and it is always special when they come to visit. I hope they have had as nice a time with us as we have had with them. I do know that Russ wants to buy a little house here, close to a golf course, and a little town, with some good old fashioned Irish pubs, where the regulars are little old Irishmen, full of jokes, and stories of bygone days. They are surely there Russ, and you will be welcome. 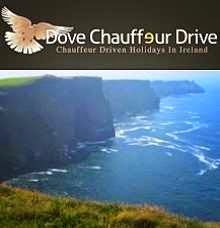 If you are planning a visit to Ireland, and you are interested in a chauffeurdriven tour, you do not have to be my cousin to travel with me. All are welcome.